I-1183, a boozy economic boost or a hit to families? You are here: Home / News / Community News / I-1183, a boozy economic boost or a hit to families? With the Nov. 8 election coming up, the debates surrounding Initiative 1183 continue to rage on among many communities, organizations, and business owners in the Seattle area. The measure, if passed, would privatize liquor sales in Washington state, making hard alcohol available for purchase in grocery and convenience stores more than 10,000 square feet in size. The possibility of rapid and widespread alcohol availability has caused many residents to question the initiative on the basis of public safety, as seen in the recent slew of TV attack ads by the No on I-1183 coalition. Alex Fryer, a campaign spokesperson for No on I-1183, says that the shift from government control of liquor sales to privatization has already proved to have negative effects. OneAmerica Votes, an advocacy group for pro-immigrant government policies, joined the No on I-1183 alliance for similar reasons. “What we’ve seen historically is that these [liquor] stores are placed in immigrant communities and communities of color,” explained Toby Guevin, program manager for OneAmerica Votes. While many voters share these concerns, others believe that privatization would offer more benefits than complications. 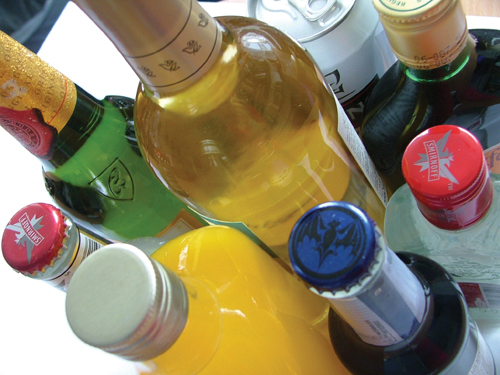 Kim believes that the main problem with the current liquor sales system is the government’s involvement. Thaddeus Teo, a University of Washington (UW) student and president of the Chinese Student Association at the UW, thinks the people of this state would not abuse a privatized system. “Washington state has a high [number] of socially conservative people [in certain areas], especially outside the city of Seattle,” Teo said. Some business owners, however, don’t see it that way. Jeannie Lee, a representative from the Korean American Grocers Association of Washington, said that I-1183 and its “10,000 square feet or more” clause would only cause further economic stress for small business owners. “Only the big stores can take advantage [of 1183]. If Costco monopolizes alcohol, and [it] is the only store that gets bigger and bigger. All the small mom-and-pop stores will die down,” said Lee. “The government has to look at it [as] a broad spectrum of all sorts of businesses. The economy [has] slowed down and the people are struggling,” Lee added. Costco, which recently became the second-largest single donor to an initiative in Washington state history, has put up $11 million thus far, causing some supporters of I-1183 to question such tactics. If the initiative passes, Costco will likely corner the market by providing the cheapest and most readily available liquor. This could make it tough for its much smaller, local counterparts to compete. “While people may want to see a change in the way Washington state regulates liquor, they don’t like companies like Costco pouring $11 million into a campaign to change our public policy,” said Fryer. Guevin and Fryer see Costco’s strong support as a threat, but they believe that Washington voters will see beyond campaign tactics. Candace Winegrad is a student in the University of Washington Department of Communication News Laboratory. She can be reached at info@nwasianweekly.com. This article was rather poor. Full of he said she said garbage containing no supporting evidence let alone any facts. vote yes. it works in 43 other states. lets not be fooled. Just to clarify, this was supposed to be “he said”/”she said” article, not an endorsement/editorial. The point of the piece was to explore Asian American support or nonsupport of I-1183 in the Seattle area, and THEIR reasons for doing so. These comments are straight from the people. Don’t shoot the messenger. Bah… More falsehood. This *is* an editorial. “If the initiative passes, Costco will likely corner the market by providing the cheapest and most readily available liquor.” This false and illogical statement is part of the “article” (editorial) text, NOT a quote from somebody interviewed. “This could make it tough for its much smaller, local counterparts to compete.” Clearly an opinion, and clearly part of the EDITORIAL text, and NOT a quote. If you’re endorsing the “vote no” side of this, just say so, instead of pretending to be unbiased. I am not sure I understand the Korean grocer’s arguments. Most of the Korean grocery stores that I’ve been to don’t sell window blinds, generators, power tools, swimming pools, or computers. Yet Costco sells all of these and the Korean mini-marts haven’t been put out of business. This argument that requiring stores to be 10,000 SQFT will somehow put small stores out of business is as bad as some of the logic that Libertarian Blogger pointed out. This is not a vote for status quo. 1183 is the only option the voters have to repeal Senate Bill 5942, which will privatize the state’s liquor distribution center to a company of lobbyists (who actually wrote the legislation). So, voters have a choice. You can vote for a bill, bankrolled by Costco, that privatizes the retail and distribution functions in a competitive market. Or you can vote no and allow our government to hand over the states distribution monopoly to a crony capitalist. Be sure to see how such a system went down in Maine before making your decision. There are some serious flaws in fact and logic in the “No on 1183” comments in this article (editorial?). Such as: “If I-1183 passed, it would be something like one in four under-aged drinkers would have access to alcohol…” One in four, but only if 1183 passes? How about a more realistic view, that “1 in 1” (everybody) has access already, without 1183. If you think youth can’t get alcohol if they want it, you have your head in the sand. Family values and teaching healthy attitudes at home about *all* consumption will have far more positive impact on under-age drinking than trying to “limit access” to alcohol (which is about as effective as Prohibition was, i.e., not at all). And: “If Costco monopolizes alcohol…” Are you kidding? Do you know what a monopoly is? Costco *cannot* “monopolize alcohol.” And then the article (editorial!) later states “Costco will likely corner the market by providing the cheapest and most readily available liquor” completely ignoring how sparsely scattered Costco stores are. In my area there are three Safeway stores and one Costco, all of which should be eligible to sell liquor if 1183 passes, and two of the three Safeway stores are much closer to me than Costco. This is not unusual — Costco does not have multiple stores in each town, unlike Safeway, Fred Meyer, and so forth. Most readily available? False! This report should also have disclosed that OneAmerica has contributed $76,000 to Protect Our Communities (aka No on 1183) inkind contributions to the campaign for mailing, ads, and staff time. This was a very interesting report, but I would like to have heard something from the yes campaign, just for balance. My understanding is that I-1183 has some very important provisions to improve public safety like creating a strict new set of compliance regulations for sellers, but it would be nice to hear how the backers of the initiative explains it.